Disclaimer: I was provided with products in exchange for my honest opinions. Your views may differ from mine! Thank you! Fathers day is a few days away and it is time to stop procrastinating and order that perfect gift that you've been trying to decide upon right up until the last moment - maybe you still haven't decided yet, at all? If you have not found anything, quite yet, then Hammacher Schlemmer is a great place to find unique gifts for dad and provides a multitude of fun, fascinating, useful and inventive ideas, which can be delivered right to your door in no time at all. If you have a man who wants to get into shape, who loves to work out or someone who really wants to try some new equipment, then he is going to love The Compact Core Exerciser, which simulates cantering on a horse, uses no electricity and is easy to master, even in a storm with the lights out and no distractions from the modern day pull of social media (imagine that!). My machine arrived recently and it literally took me the time it took to boil water (and cook pasta), to put the machine together! There were just a couple of bolts, pins and things to assemble and I was on my way. I was honestly not sure quite what to expect from this machine as I have never ridden any horse or pony, but I did once try out a bucking bronco at an event and this seems like a very mild version of a bucking bronco, without the desire to throw you off at a moment's notice. You can adjust the seat and I am happy to say it is comfortable for my 6 foot tall frame and long legs, which is always the first thing I have to consider when considering anything more. To get the machine going, you gently rock back and forth on it to build up some momentum and then as you get going you are propelled as though on horseback with very little trouble at all. The seat is well made and big enough to be comfortable and you could theoretically sit through a movie while on this machine - though I am not sure exactly how realistic it would seem to want to exercise for a 3 hour movie, so perhaps a half an hour to an hour T.V. show might be more comfortable in the long-term! I love how small this is, yet it is still built sturdy and well-structured that I don't feel like it is going to fall apart on me anytime soon, which is just what I like when I see a new piece of equipment. The color is blue and black, which is just fine by me, but I'd love to see it in some bolder colors to maybe blend in with some personal decor seeing as it isn't the easiest thing to store away in my apartment. 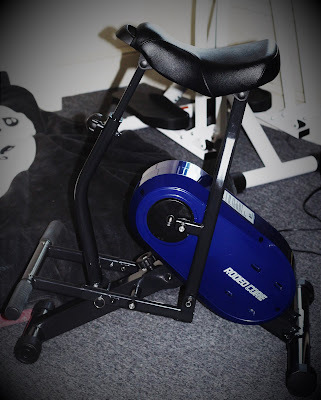 I know that any dads who are fit, want to keep fit, or get fit would do well, even as a first timer, on The Compact Core Exercise machine as I am usually bored of exercise after a minute - yet this machine is fun, easy to use and just gives you a joyful workout. I absolutely would love for your to take a look at The Compact Core Exerciser on Hammacher Schlemmer's website right now, where you will also find an array of items from wine coolers to drones, home spars to outdoor living and special products that you would never think to purchase any place else! The Compact Core Exerciser has a 4.5 star rating on the Hammacher Schlemmer website and I would have to say that I agree! The machine comes with a lifetime guarantee and so if you try it and something goes wrong, then no worries! Hammacher will do what they can to replace or refund the money you spent and to help keep your machine in as best condition as it possibly could be, and you can't ask for better service than that. What kind of things do the dads in your lives like to do in their spare time? Is dad a big child at heart, or a fitness fanatic? Does he like to try quirky things or just push the boat out find something new? Whatever his personality, Hammacher Schlemmer is here to help, and with an I.O.U in dad's card, this year, he can even pick whatever he wants from their website, and get just as excited as I did when I knew this machine was on its way, and even more so when it turned up at my door! For $249.95, I am ready to have fun with this machine in my own home, without having to subject myself to a judgmental gym, and I know some of you must be with me on that sentiment? Let me know how you feel about this machine! Do you ride horses? Have you ever tried a machine like this before, and how did it go? I'd love to hear your feedback, as usual, and I'll even be able to read them a while, while also cantering on the spot in my own home - fabulous! Follow Hammacher Schlemmer across social media (Facebook, Twitter, etc) and pick something up for Father's Day, today - remember, if it is on the way, it counts, and dad is going to love it! If he doesn't, and he wants a robot instead, or a giant Pac-Man arcade machine, then great! Hammacher Schlemmer has those, too and will be more than happy to figure it out, with their great team, who have always guided me in the right direction, no matter what the occasion! So what are you waiting for? Treat dad, today! I used to get the catalog but no more. Thanks for reminding me of all the good stuff it contains. This looks interesting for a gift for hub. My husband loves products from this store. They always have unique things. Unfortunately, my dad lives far away but he would definitely love this. It's a great gift for a husband or a friend. This seems like a great price for a good piece of equipment. We are fortunate to have a gym in our building so we don't have to accommodate any exercise equipment right in our apartment, but if we did, this sound like a good one! This would actually be perfect for my husband. He recently switched to a desk job and is getting a little too sentient. Looks like a great machine! It could fit in the corner of our tiny gym! It's a nice gift for dads who would like to be active or those who are very much into working out. I love that it's compact so it doesn't take much space in the house! My dad could use this whenever he can't go out to walk. I will check this out. I wouldn't mind one of these myself! Definitely love how compact it is! Wow, sounds like a great product. I love to purchase one for my husband and I would be so happy to use this too. This is perfect for any dads, a nice gift idea this father's day. I love it because it is compact and won't eat too much space. That's a gift for both Mom and Dad! Those are the kind I love most! What a great gift idea! I know my dad would enjoy this. A great idea for fitness minded dads!! Heck, I want this for myself. I know I'd use it more than my husband lol! This is a great idea for a gift! I know he will love it ! I bet my husband would love this. He loves fitness items. Right now he is mainly in to weights, but I know he'd use this product. Even I would love it! I like that you can adjust the seat! Bet my son would like this for Father's Day. They always have the coolest stuff! My uncle would love that for father's day. I need the catalog! Looks like a good gift for fitness buffs or people who are really looking to spend more time pursuing a healthy body. Thoughtful! This is so cool!!! I want one for myself. I like this one because it is compact. I think every dad needs a tool like this, especially the busy ones. I'm not married myself but I know several men that would love one of these. It's a great way to promote a healthy lifestyle and help them get in shape.